A bus makes a stop in the City of South Lake Tahoe. The Tahoe Transportation District will no longer use a contractor to operate its bus routes. 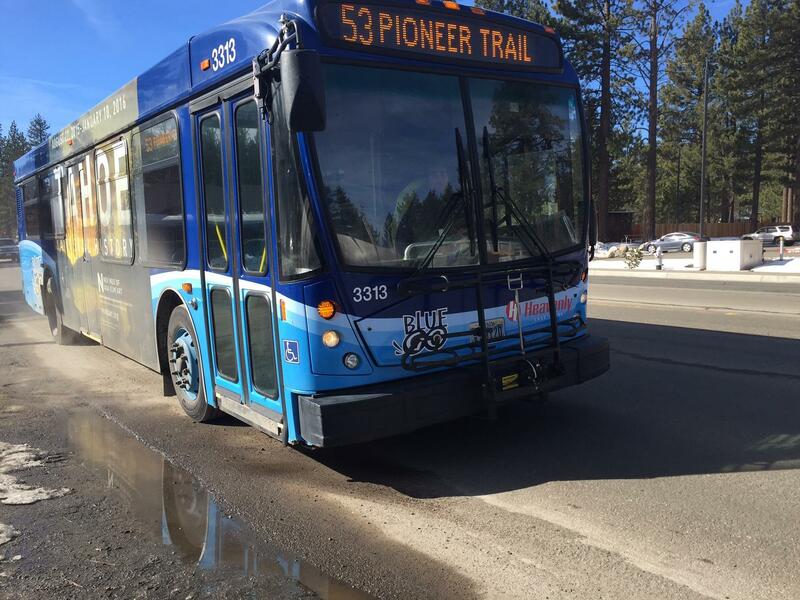 The Tahoe Transportation District is taking over control of daily operations for its 42 bus routes around the south shore of Lake Tahoe. The District will not renew a contract with company Keolis, which had been operating its bus system for the last few years. Carl Hasty is district manager for the agency. He says this will help them be more efficient as they work toward increasing ridership around the lake. "For where we need to go in the basin, in order to alleviate traffic, is to get more people onto public transit, and have that be more like more successful resort communities," sasy Hasty. "For us to do that, it means having more of a hands on approach to developing the staffing and the facilities and so on. And that's more difficult to do when you're removed from that by turning that over to a contractor." The move won't save the district any money, but will be folded into its annual $6 million budget. Bus routes and fares will remain the same during the transition. The agency is also preparing to release a mobile app later this summer to help riders plan their trips. Yesterday we looked at ways Lake Tahoe jurisdictions are reducing how much road grit is polluting the water. But environmentalists contend the only meaningful way to “Keep Tahoe Blue” is getting people out of their cars altogether. Our reporter Julia Ritchey explores if that’s really feasible. At a bus stop off Highway 50 outside of The League to Save Lake Tahoe headquarters, Jesse Patterson is waiting. Tahoe transportation officials hope to drum up support for a project that could alleviate traffic woes at the state line. Reno Public Radio's Julia Ritchey reports. Carl Hasty of the Tahoe Transportation District gave a bus tour last week to local media on a project that would reconfigure the main artery running through South Lake Tahoe. Of the five proposals under consideration, Hasty is advocating for one that would realign four lanes of U.S. Highway 50 along Lake Parkway behind Harrah's and Montbleu casinos to the Village Shopping Center.